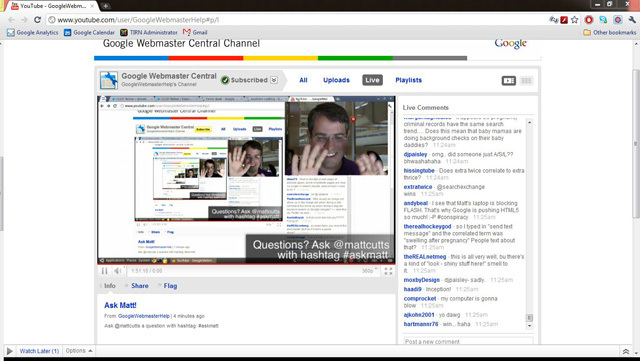 Yesterday I made the bold (sarcasm) prediction that Matt Cutts would do a live Q&A in the near future. Well, it turned out to be right. I think we're going to try a live video stream RIGHT NOW! And there it went, Google reached over 700 concurrent people watching the live Q&A, a total of over 1,000 users watched this live. Amazing numbers for something last minute. It aired for about two hours and Matt maybe got through a quarter of the questions submitted. I am a bit surprised to see the live Q&A was not published yet in the archives. 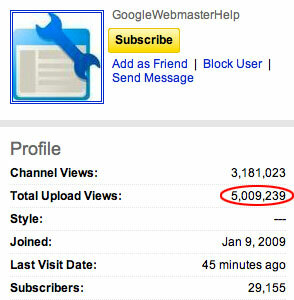 In fact, people are asking if it will be published in the Google Webmaster Help forum. Matt McGee was taking notes and published them at Search Engine Land. I do suspect Google will be doing more of these live Q&A events. It worked out so well.